FAMOUS is a facial animation system, which allows animators to use an actor's performance to animate dialog and facial expressions in productions. Control over the face's behaviour, as well as the calibration of the actors face with the character face, is made easy in the design of the interface with the exaggeration and directional skewing of facial movements being controlled by direct manipulation. FAMOUS is a standalone program running under Windows NT 4.0, with directly interfacing modules available that allow it to be used from within SoftImage, 3DStudio MAX2 and Maya - which imports and SoftImage, 3DStudio MAX2 and Maya which imports and exports animated faces, enables rendering of animated faces, and launches FAMOUS without leaving your favorite animation package. 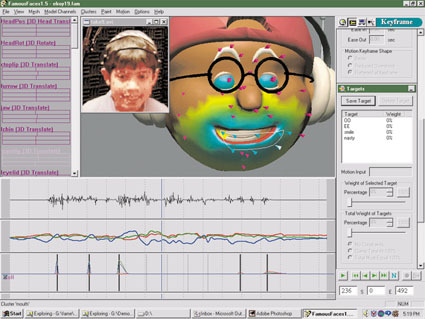 Click here for facial motion capture, computer animation, 3d modeling, image rendering FAMOUS facial motion utilities.